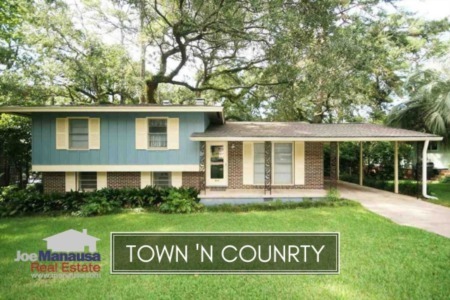 Located on the NW side of Tallahassee about a mile away from the (currently being renovated) Tallahassee Mall, Town N Country Park is an established neighborhood with homes built from the 1960s through the 1980s. When the renovations are final and the Tallahassee Mall begins to re-energize this central location in town, I expect the economic growth to have significant and immediate impact on neighborhoods nearby, therefore Town N Country Park homeowners can expect to be beneficiaries of this large renovation effort. 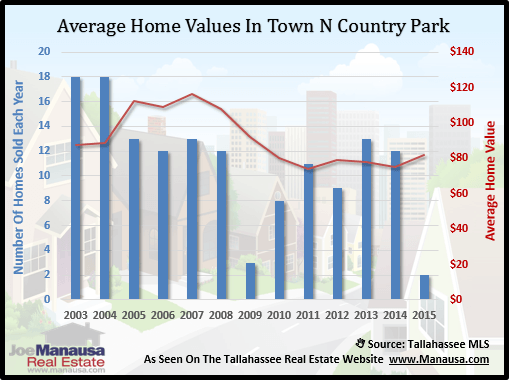 In this report, we will look at prices, values, and sizes of homes in Town N Country Park, as well as show current listings in the Tallahassee MLS and all closed home sales going back to 2007. For each of the three real estate graphs found below, you will find the number of closed home sales for each year (blue columns, measured on the left vertical axis), and an important real estate statistic shown in red (measured on the right vertical axis. It is important to note that sales are through December for all previous years, but through the first week of March in 2014. Average home prices have fallen 24% since last year, due to the fact that the smallest home sales in many years just occurred in Town N County Park. Home prices fell 5% in 2014 versus 2014, and much of the blame can be placed on the abundance of distressed properties that were sold. The average recorded sales price is $99,550 for Town N Country Park thus far in 2015, but expect it to end the year closer to $140,000. Home sales activity in 2014 was consistent with the best years since 2005. 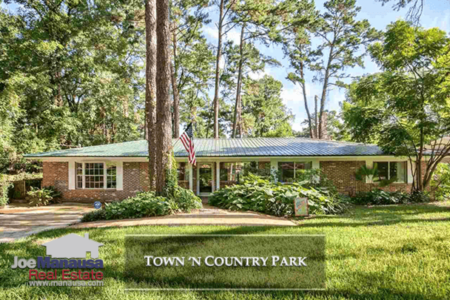 Thus far in 2015, there have been 2 closed home sales in Town N Country Park. Average home values in Town N Country Park declined in 2014, as distressed home sales has a significant impact on valuations. But we have already seen a big jump in values in 2015 with the first two homes sold. 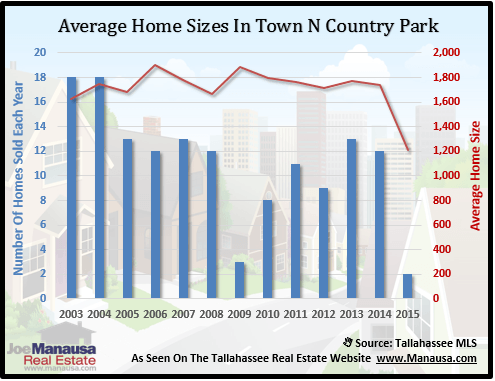 Buyers and investors would be wise to recognize that single family homes on more than a quarter of an acre within walking distance to shopping and schools will return to high demand when the supply and demand for houses in Tallahassee stabilizes. 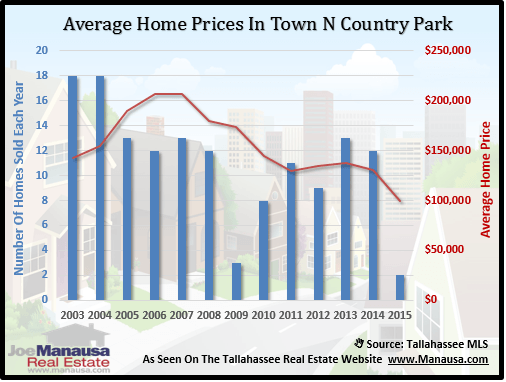 As I have said before, you can bet an investment made in Town N Country Park today will provide an excellent return when the housing market in Tallahassee stabilizes. Through March, the average value of a home sold in Town N Country Park this year has been $82 per square foot. This means that home values are still much lower than the current and future cost of replacement. The average home size sold in Town N Country Park typically falls in a range of 1,650 to 1,900 square feet, but 2015 has started off with a very small home sale that has shot the average below the normal range. The 12 sales in 2014 averaged 1,743 square feet, but the two so far in 2015 have averaged just 1,214 square feet. The following list shows home sales going back to 2002 in Town N Country Park. I hope you enjoyed our March 2015 update on home sales in Town N Country Park, please feel free to drop me a note if you have questions not covered in this report.